Hikers walk through Mill Canyon in the East Tintic Range. In the southeast corner of Tooele County, there is an interesting group of mountains known as the East Tintic Range. The mountains, which straddle the borders of Tooele, Juab and Utah counties, yielded vast mineral riches back in the 1800s. According to the Utah Geological Association abstract, the mines were first discovered in 1869 and produced more than 20 million tons of silver, gold, copper and zinc ore valued at over $3 billion in today’s currency. The mountains may be named after a famous and feared Ute Indian Chief named “Tintic,” who operated in the central mountains of Utah and the West Desert during the time Johnson’s Army occupied Camp Floyd. In fact, there is a story about Tintic escaping from soldiers at Camp Floyd after treaty negotiations fell apart. It is said he drew out a large knife from his waistband, sliced a cut in the side of the tent, and escaped into the mountains to the south, and quite possibly, the East Tintic Range. Such glory days of wild mining and fearsome war chiefs are a distant echo in the Tintic Mountains; the range is largely abandoned except for the town of Eureka just south of the East Tintic Range. The range is a large bulk of mountains north of Eureka and east of Vernon that should not be confused with the Tintic Mountains, where Eureka and the ghost towns of Mammoth and Silver City are located. About 90 percent of the range is administered by the Bureau of Land Management and is public land. There are, however, pockets of private property and they should be respected and avoided. The East Tintic Range measures 12 miles long, from aptly named Twelve Mile Pass in the north to the area around Eureka and Tintic Junction to the south. At its widest point, the range measures just over eight miles. 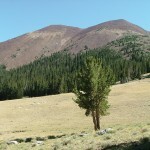 The highest point is Boulter Peak, at 8,308 feet high. 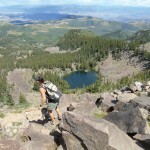 Numerous other rounded summits rise to 7,800-8,200 feet high in the Boulter Peak area. Several major canyons cut the mountain on the west side. From north to south, some of the main ones are Barlow, Black Rock, Mill and Miners canyons. To the east, a long valley named Broad Canyon trends from north to south. It is possible to drive up Black Rock Canyon in a four-wheel drive vehicle over the crest of the range at about 7,000 feet and then down into Broad Canyon by an overgrown road. Even though these mountains are relatively low in elevation when compared to the Oquirrh, Sheeprock or Wasatch ranges, the northeast-facing slopes of the higher canyons are covered with dense growth Douglas fir and white pine. 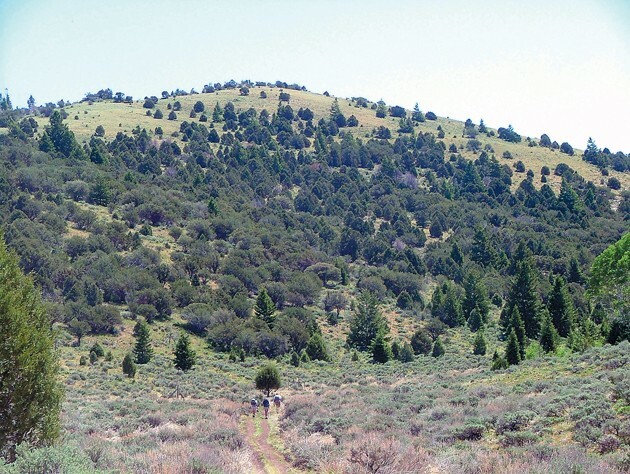 The south-facing slopes in many areas are devoid of trees and are covered with sagebrush. Aspen occur in a few scattered clonal bands, principally below the north face of Boulter Peak. These unexpected stands of white bark aspen, with their green meadows, are a welcome respite from the surrounding desert. Unfortunately, some people are fond of carving their initials into the trees’ flesh. Given the dry climate, the trees struggle to survive already, but when someone vandalizes them, their inner pulp is exposed to disease and eventually each carved tree dies. Try to remember that next time you see someone pull out a knife and head for a live tree. Below the north face of Boulter Peak is a large open bowl at the head of Miners Canyon that is ringed by the highest hills in this area. In the west end of this bowl is a “Dry Lake.” The bowl that contains this dry lake is pretty. In some parts the grass is knee deep. Up high in the top of the canyons, this little group of mountains will surprise you. It seems like you are at greater altitude than reality. There are two principal approaches to the East Tintic Range from Tooele Valley. First, follow SR-36 south to the junction with SR-73. Turn left and east on SR-73 and follow that road along the west foot of the Oquirrh mountains to the area known as “Five Mile Pass.” Two improved gravel roads head south from this point. The first one is the “Faust Cut Off” on the Pony Express Trail. Do not turn right on this road. Shortly after you pass that road, another will branch off the main highway and head almost straight as an arrow south along the old “Topliff” railroad grade. About 6.5 miles south along this road you may see some old concrete foundations for a water tower and notice a large quarry to the east on a knoll. This is the site of the old Topliff ghost town. According to Stephen L. Carr in his book “The Historical Guide to Utah Ghost Towns,” Topliff was established in the 1870s to provide limestone for smelters in Rush and Salt Lake valleys. A train load per day rumbled along the road bed. Continuing past the scattered remains of Topliff for another nine miles south, you will reach Black Rock Canyon Road. This is the main entry point into the range and this road is by far in the best condition. 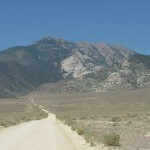 The other, faster route to the East Tintics is to follow SR-36 south to the town of Vernon and then as the road bends east at that town, continue approximately another 9.5 miles and you will see a BLM sign that states “Black Rock Canyon.” Turn left here and follow this improved gravel road about 4.2 miles over to the mountains and the mouth of Black Rock Canyon. Black Rock Canyon is a narrow gorge with the bottom being around 6,100 feet in elevation and the ridges on either side rising well over 7,000 feet. After a few miles’ travel from the canyon mouth, the mountains open into a wide bowl, much like the one below the north face of Boulter Peak. Depending on the time of year this is a grassy green valley with a few intermittent ponds. The north-facing ridge rising above is densely covered with mixed fir forest up to the ridge top at nearly 8,000 feet. The canyon road becomes more primitive beyond the meadow/bowl and climbs the head of the canyon to a pass at 6,941 feet, which is higher than Johnson’s Pass. It was several years ago the last time I went over this pass. It challenged my vehicle. The scrub oak was dense on the east side of the pass as I descended into Broad Canyon. It was autumn and the leaves on the oak were red and the soil of the road was rich and black. I followed Broad Canyon north for seven miles and arrived at Twelve Mile Pass. I next cut west back over to the Topliff railroad grade road, which completed a large circuit cutting through the range. In next week’s article, we’ll finish our discussion about the East Tintics and include a detailed description of Mill Canyon and the most reasonable approach to Boulter Peak. 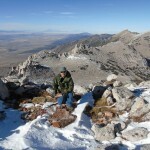 Jessop grew up exploring the mountains and deserts of Utah and has traveled to all 50 states, U.S. Territories and a dozen foreign countries. He and his family live in Park.